I've been working my way through a new set of journal pages. 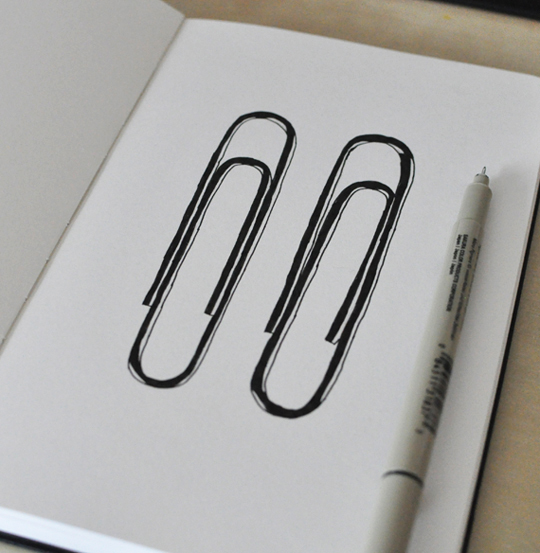 At one point, when I needed a breather, I took a stab at drawing some paper clips that have been on my desk forever. I keep meaning to put them away . 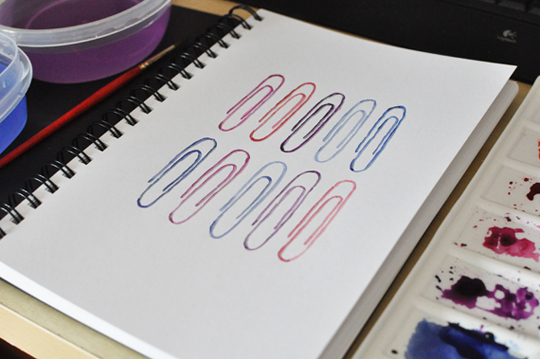 . .
Then I wondered if I could paint more paper clips. Turns out, the top two were enough. I wasn't happy with the watercolour bit at all, but it gave me some ideas for next time, which is at least one good reason to experiment, don't you think? Your simplicity is mesmerizing! Very cool paper clips! just found your site on pinterest...loved the 50 page journal...are there colored page borders for pages 1 through 15? if so could you direct me to them. ? thanks so much.